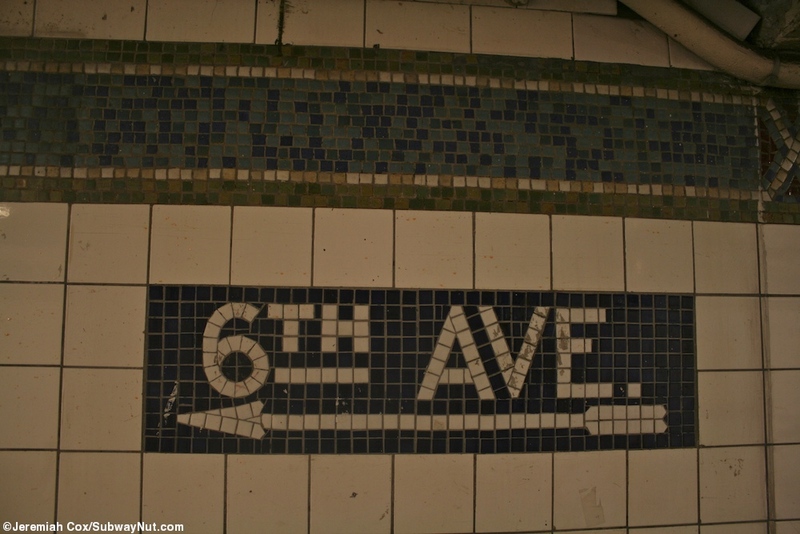 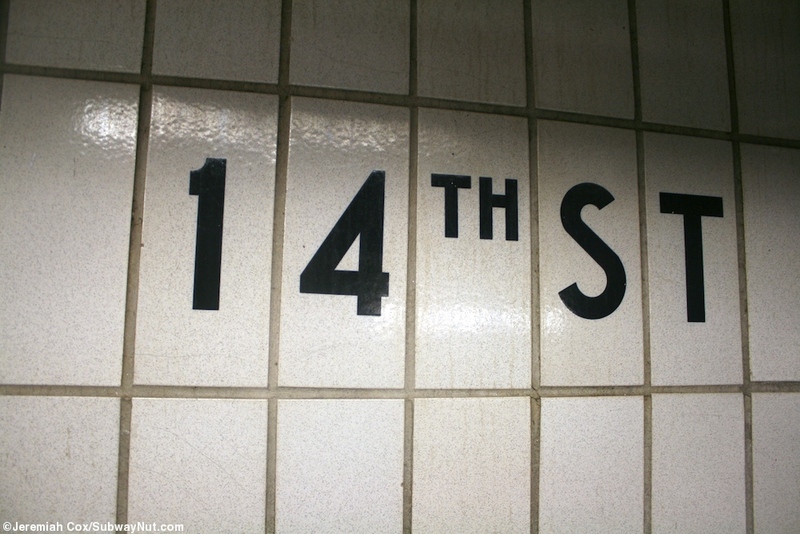 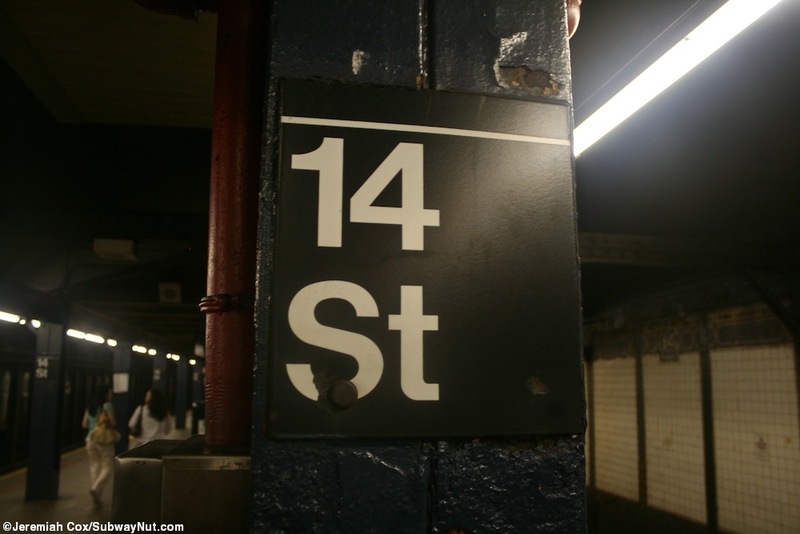 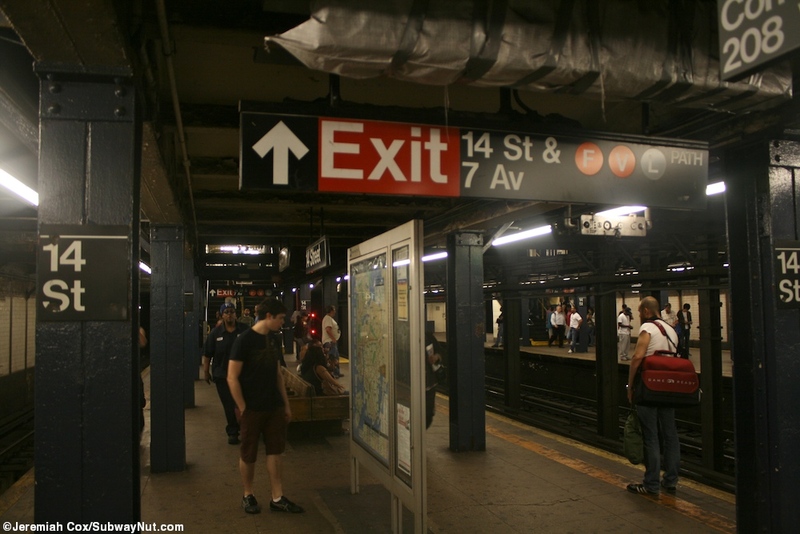 The 14 Street and 7 Avenue station has two island platforms for the four tracks since it is an express stop. 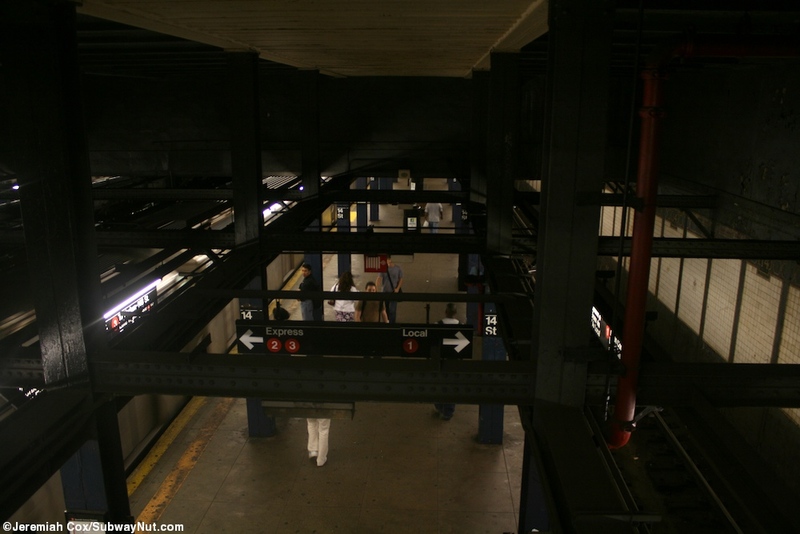 These platforms have lines of blue columns and whose height changes depending upon if there is there is a mezzanine above. 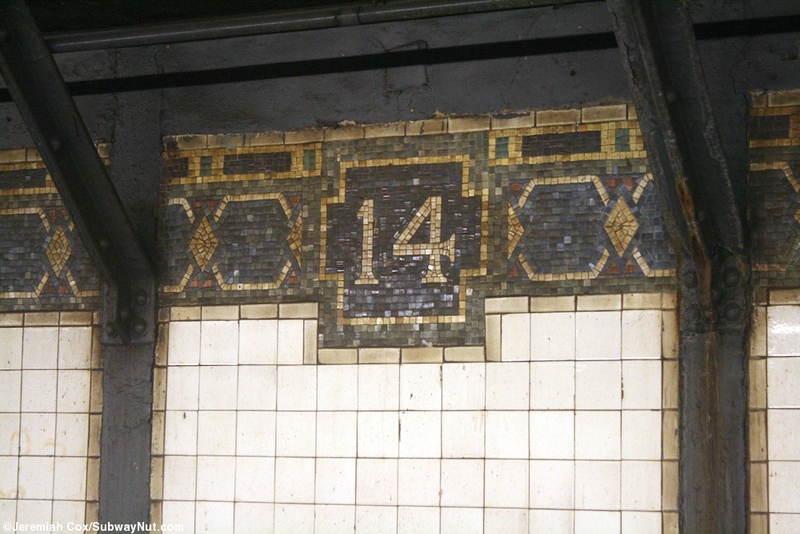 The track walls have a green, blue and gold trimline with hard to see 14s along it at regular intervals. 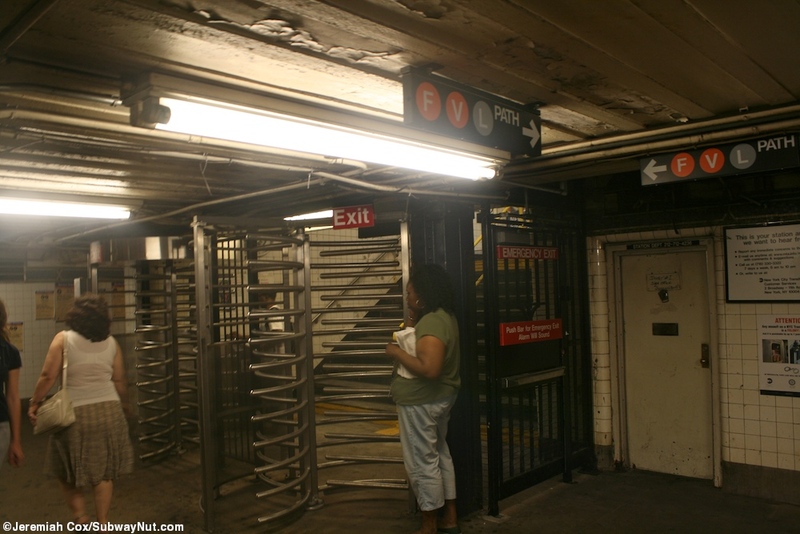 For exits the station has three each from their own mezzanine areas. 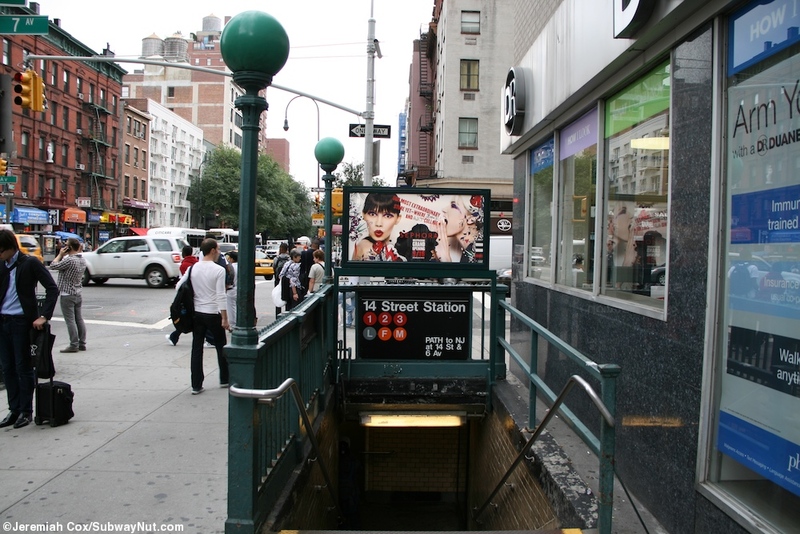 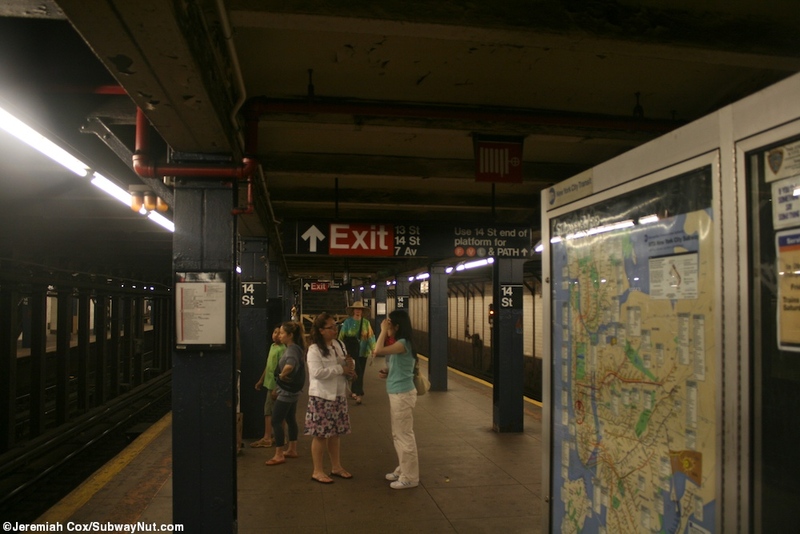 Starting at the less important southern end, a staircase leads up from each platform to a narrow mezzanine area with both high and low unstaffed fare equipment in the middle of it and streetstairs at the NE and NW corners of 12 Street and 7 Avenue. 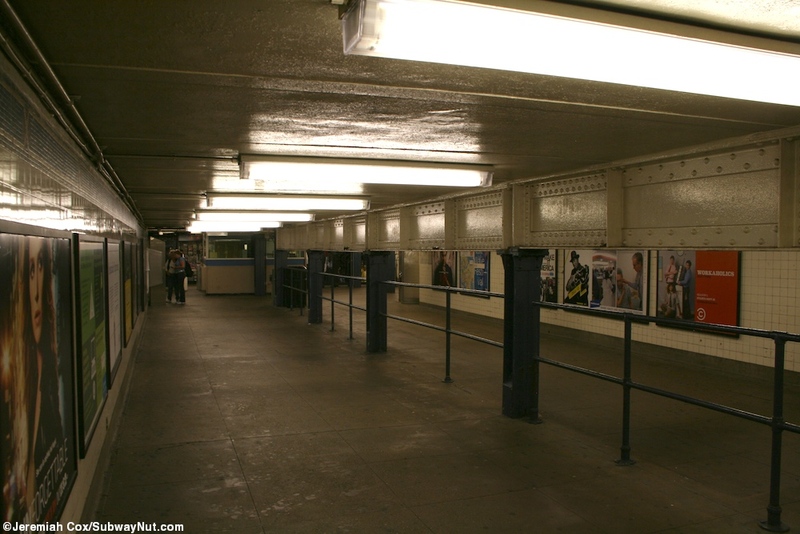 Next in the middle of the platforms two staircases form each lead up to another overpass. 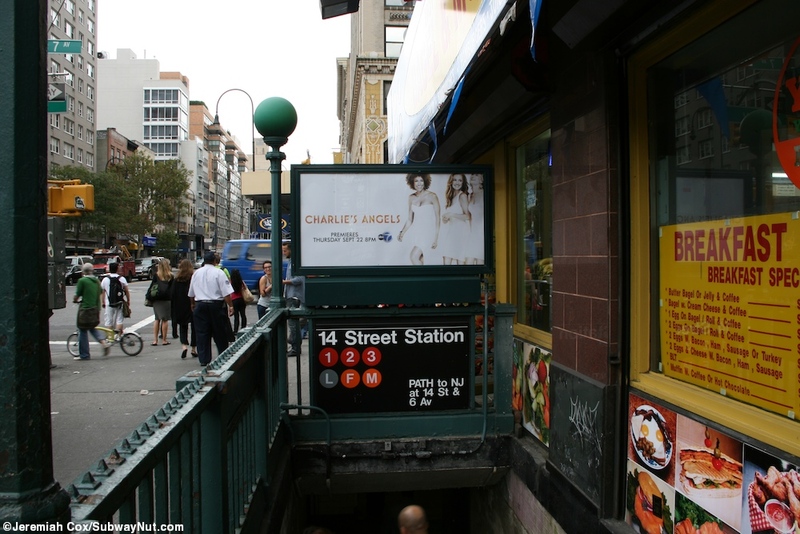 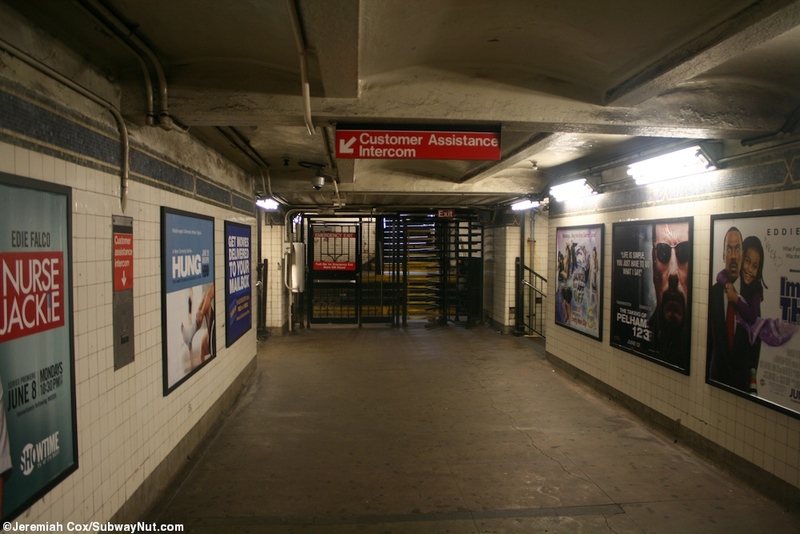 At each end of the overpass is a high exit only turnstile, one leads to the NW, the other the NE corners of 13 Street and 7 Avenue. 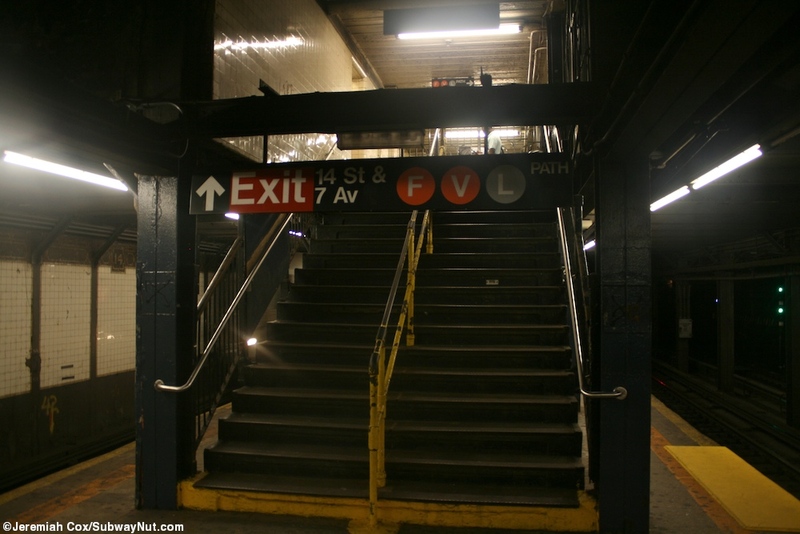 The northern end of the station is where the main mezzanine area is accessed via just a single, wide staircase from each of the platforms. 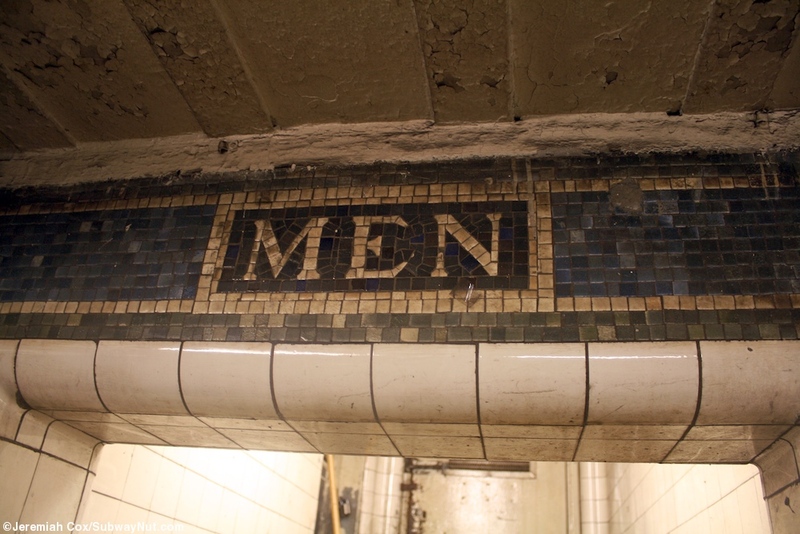 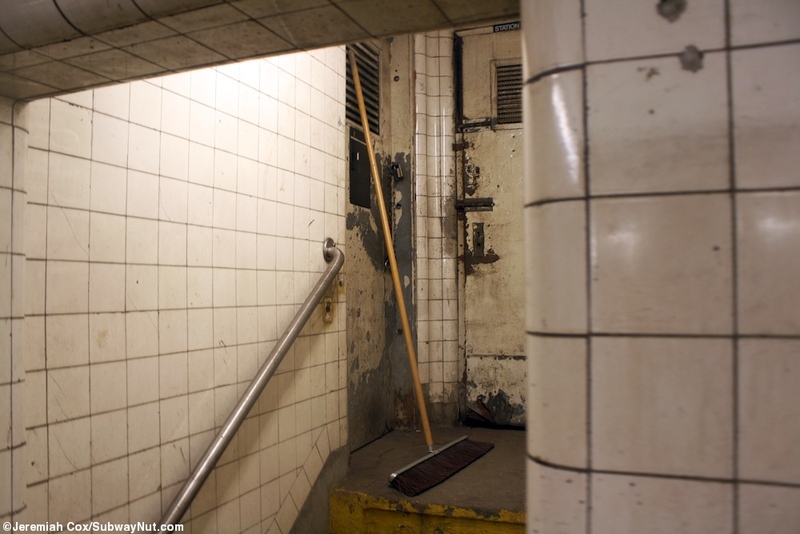 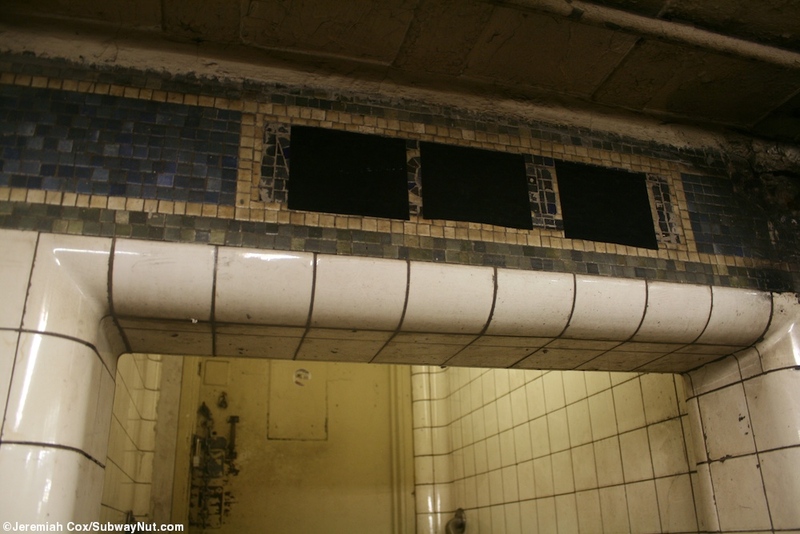 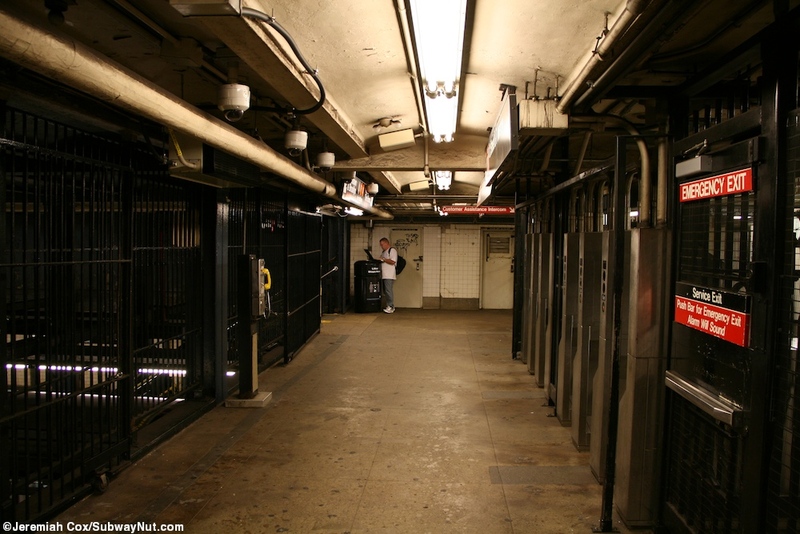 It is split into two by the corridor that leads to the now free transfer through the tunnel towards 6 Avenue and the L platform, this tunnel begins by going down some ramps before level off. 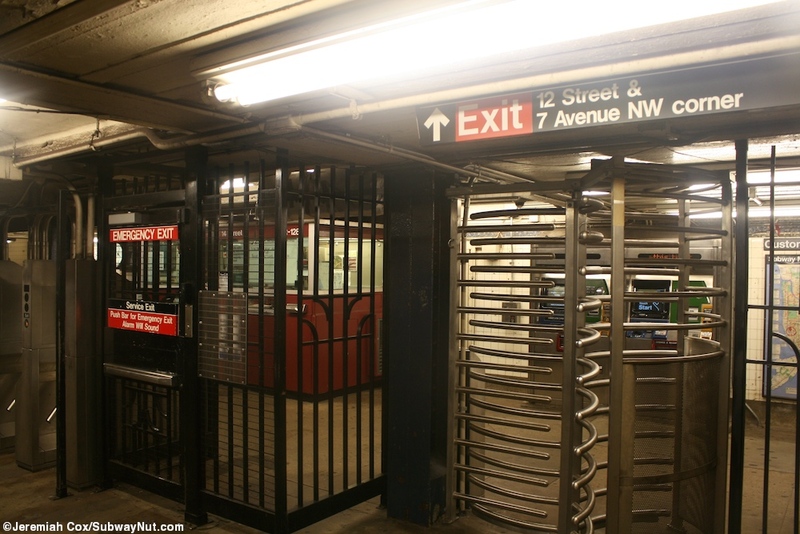 On the narrow side of this area are some high turnstiles that lead to a streetstair up to the SE corner of 14 Street and 7 Avenue. 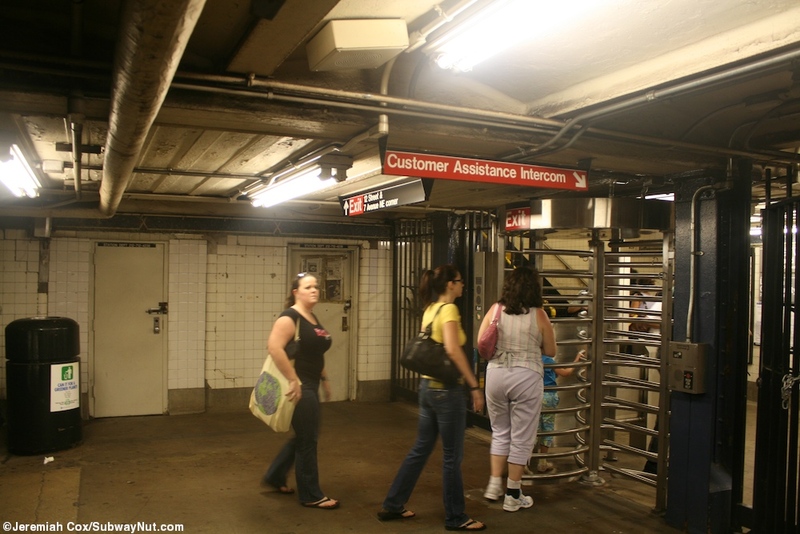 On the opposite side of the corridor for transferring passengers is the staffed bank of turnstiles with their token booth. 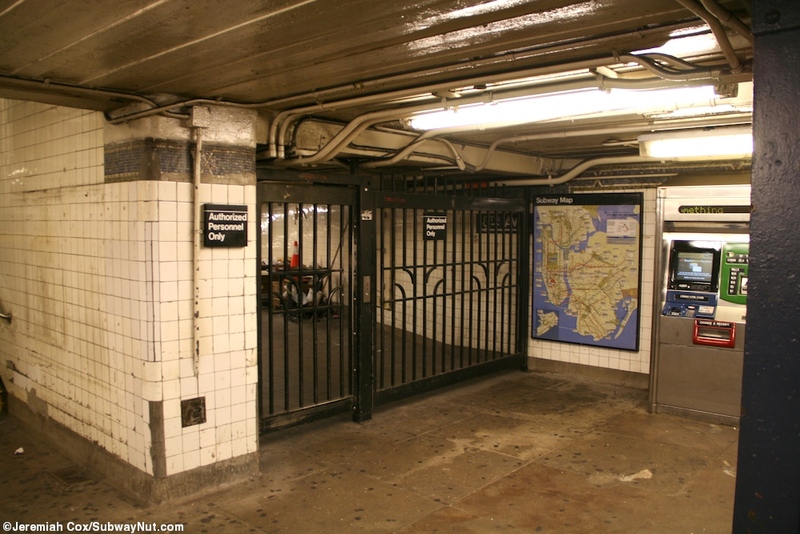 It leads to streetstairs at the NE, NW, and SW corners of this intersection and the former underground passageway to 8 Avenue gated off in non-public use can be seen, used by plenty of employees who can be frequently seen inside the passageway.